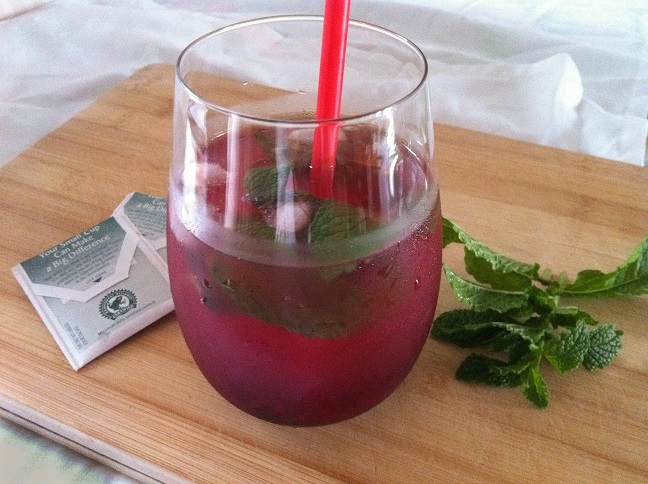 Iced tea lemonade with a hint of mint and crushed blackberries, a refreshing drink for a hot summer day. During the summer, two of my favorite drinks are iced tea and lemonade. There’s something just so refreshing about those two beverages. Slightly sweetened and very delicious jam filled with the flavors of summer. 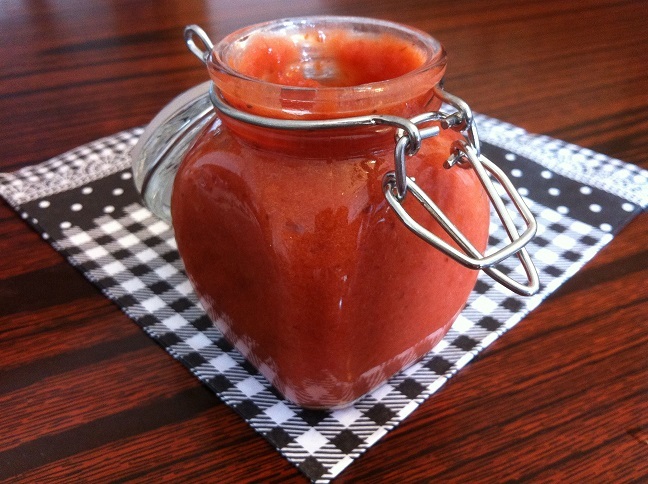 Strawberry and peach jam is perfect as a spread on bread for a tasty breakfast or on crackers for a quick snack. 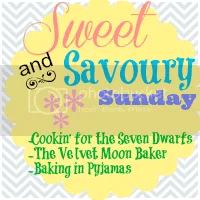 It’s time for another summer inspired recipe! 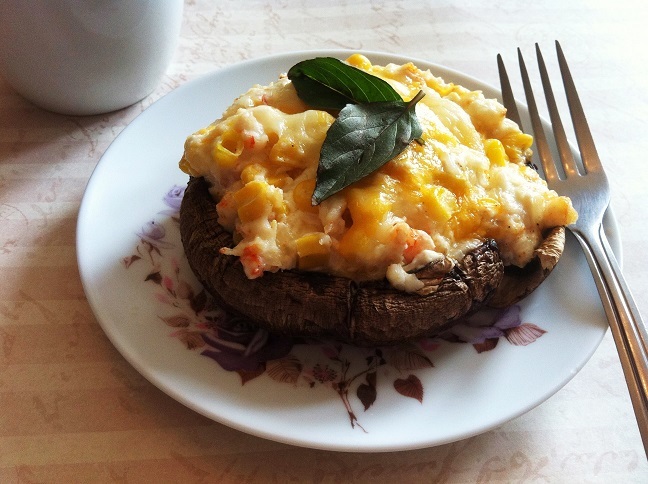 Portobello mushroom stuffed with creamy shrimp and sweet corn for a delicious appetizer or mini meal. Sweet strawberries and peaches blended and frozen into delicious Popsicles, perfect summer treats with no added sugar. 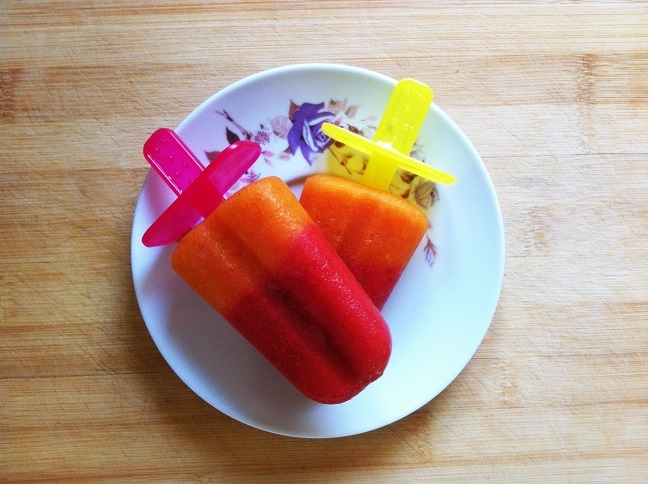 I am super excited to share this popsicle recipe with you and with my friends at Fiesta Friday! Filled with my favorite fruits, strawberries and peaches, they’re delicious, healthy, and easy to make (but unfortunately not quick due to freezing time.) What more can I ask for in a summer treat? I can eat these all day and not feel guilty. Although… they might not freeze fast enough for me to devour them all day. 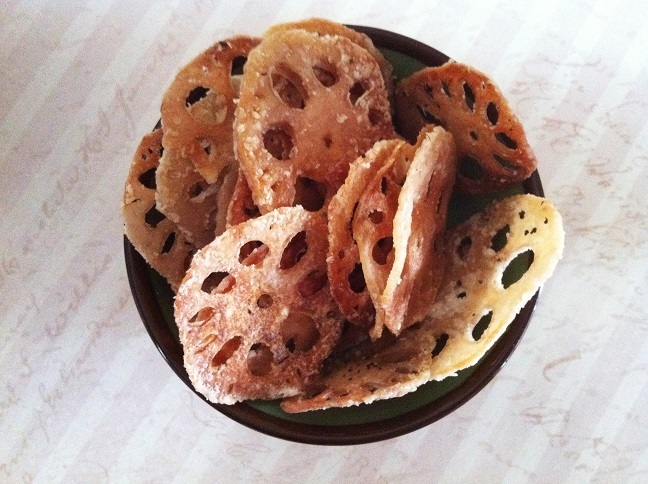 Sprinkled with salt and pepper, these lotus root chips are crispy and delicious. It’s an Asian inspired snack that’s both healthy and easy to make. Last week, my best friend and I went to a dumpling restaurant because we’re both obsessed with Shanghai dumplings, the ones with the soup in the center. While I was browsing through the menu, I noticed that they offered lotus root chips as an appetizer. I didn’t order them, but all of a sudden, I had this craving for them. I know. Odd, right? How can you crave something you’ve never had before? But I did. 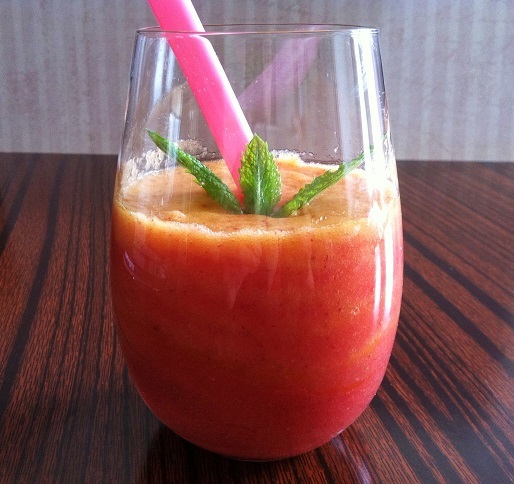 Sweet strawberries and peaches blended into swirls of red and yellow orange for a healthy and delicious smoothie. This beverage is summer in a glass, perfect for a hot day. 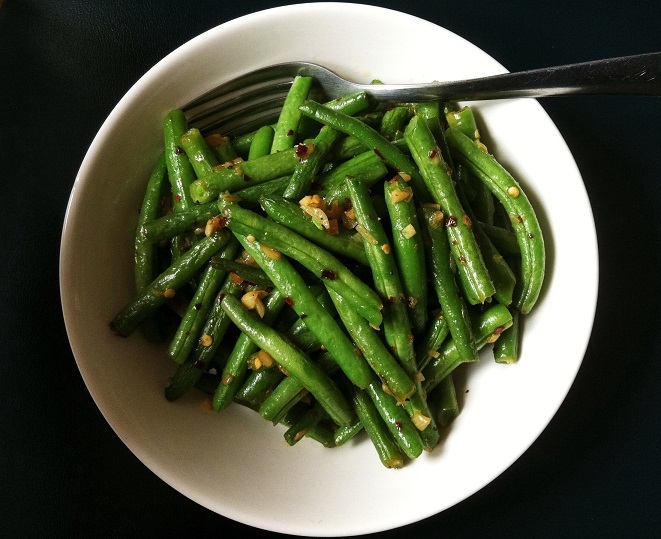 String beans stir fry with garlic and crushed red pepper for a simple and healthy side. This dish is great for a quick dinner idea after a long day at school or work. 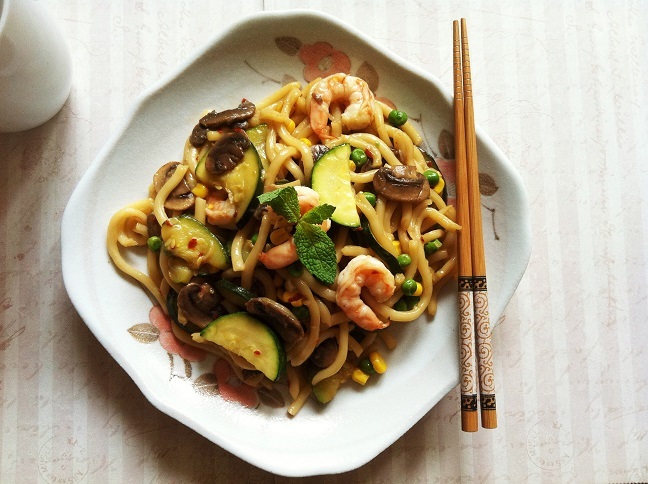 Japanese inspired udon stir fry with shrimp, sliced mushrooms, zucchini, sweet corn, and peas in delicious teriyaki sauce. This dish is both healthy and easy to make, a great choice for a quick meal. It’s Father’s Day this weekend. Have you made your plans yet? White chocolate blondie bars filled with fresh strawberries in each bite, a twist on the classic brownies. 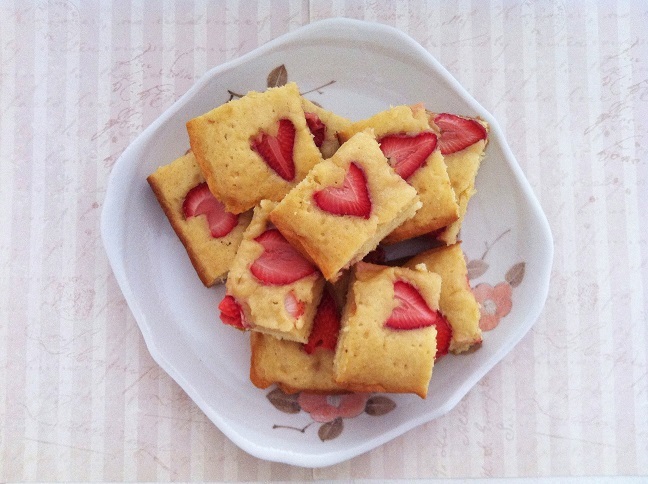 Topped with sliced strawberries, these blondies are perfect as a gift or as a summer dessert. I’ve wanted to make brownies using white chocolate for the longest time. And what could be better than chocolate and strawberries together in one dessert? My favorite combination ever! 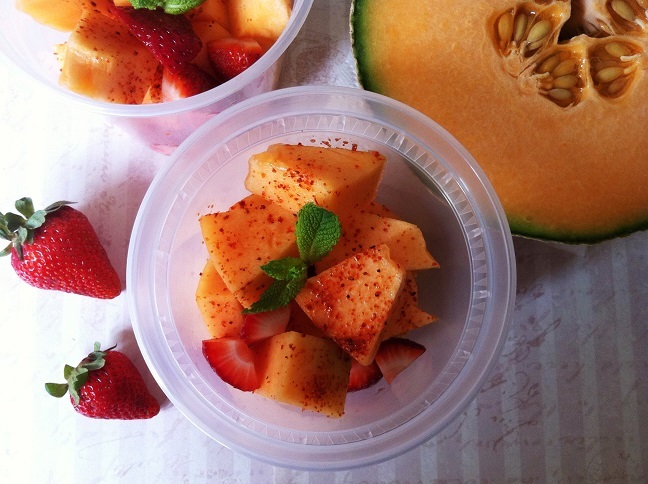 A refreshing mix of chopped fruits seasoned with citrusy lemon juice and tangy Tajin. A quick healthy snack for the family on a hot summer day. Have you ever had a Mexican Fruit Cocktail? If you haven’t, you’re missing out! It’s one of my favorite desserts during the hot summer season (and throughout the year).